I had first become aware of the world of Bitcoin and crytpo-currency mining in 2011 when Bitcoin first became a wide phenomenon and peaked at around $30.00 USD. I didn’t think much of it at the time and thought it was too volatile to get involved with. Fast forward to late 2013, my interest was again peaked after hearing about a number of new crypto-currencies that were being developed to compete with Bitcoin. I setup the mining software on my computer (cgminer) and gave it a try. Unfortunately, I didn’t really make any money because I didn’t have the proper hardware to run a profitable Bitcoin mining operation. There are a variety of specialized computer systems that are built to for the sole purpose of mining Bitcoin, which range from a few hundred dollars to more than twenty thousand dollars. I started to look at the various hardware options from the perspective of an investor and did a classic break-even analysis. I checked out various graphics card-based systems to mine Litecoin and its competitors, as well as several different ASIC machines that would mine Bitcoin directly. I found that computer mining hardware would pay for itself after 90-180 days of operation based on the hashing power of the rig and the current profitability of mining. It almost seemed too good to be true that a system would pay for itself in such a short amount of time, but I thought I’d give it a try. I ended up spending approximately $9,500 on two computer systems that each had five Radeon R290 graphics cards. Between those two computer systems and my iMac, I have a total hashing power of about 8.5 Mh/sec, which simply means I can calculate 8.5 million hashes against the “scrypt” algorithm every second. There are a variety of calculators that you can use to determine how much a particular amount of hashing power each will earn each day, such as CoinWarz. This number can vary wildly on a daily basis depending on a variety of factors, but has averaged to making anywhere from $40-$70 per day depending on market conditions. The machines that I purchased don’t actually mine Bitcoin, but use a platform called Wafflepool to mine competing crypto-currencies and automatically exchange them for Bitcoin, which then automatically gets exchanged for USD (real money) through Coinbase and deposited into my checking account on a weekly basis. The profitability of mining the competing coins, the exchange rates between those coins and Bitcoin and the price of Bitcoin all come into play when determining how profitable mining is at any given point. The break-even point is far better than any traditional investment that one might make in the markets, but there are a lot of factors that one must consider before forking over cash for expensive mining hardware. First, these computer systems use a lot of power, make a lot of noise and generate a lot of heat. The noise is tantamount to having a vacuum cleaner running 24/7. Each system also needs to be on its own 20 amp circuit. You would not want to put a mining rig in a room that humans will spend any meaningful amount of time in. Mining rigs also require daily monitoring to make sure they’re still humming along and have to be rebooted on an occasional basis. You also have to make sure the mining pool you’re working through is still competitive and stay up-to-date on crypto-currency news and trends. There’s also a significant risk that mining could suddenly become less profitable due to any number of market conditions. If crypto-currency mining was a passive investment, I would sign up to repeat this investment 100 times over. Unfortunately, it’s not a passive investment. 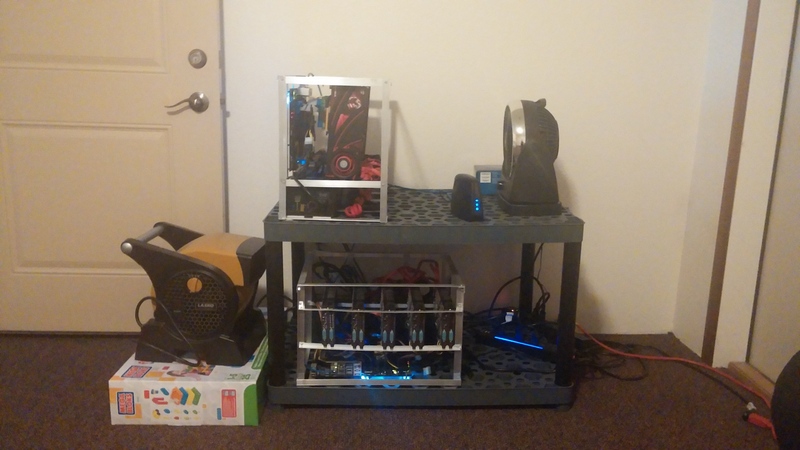 You have to house the mining rigs in your house, keep them running properly and stay up on crypto-currency trends on a weekly basis. The purchase of these two mining rigs will likely end up being a profitable venture, but there’s no real opportunity to scale it into a larger business and it’s not terribly excited compared to some of my other businesses. I’m not sure if I would repeat the process of setting up a crypto-currency mining operation all over again, but it certainly has been an interesting learning experience. I just read about Bitcoins in the new recently so I thought I would check your article out. Nice use of the Mega Blocks box. I assume that was a free acquisition. Yep. The turbine fan I’m using for the bottom rig has a very narrow stream of air, so I had to find something to stick it on to position it just right. Hey that looks like a great setup. Where do you recommend buying the cards from? what brands are good? thanks for your help. Very cool! Hi Tony – Cards tend to be hard to come by these days. Your best bet is to either buy them on eBay for quick shipping or wait until Newegg, TigerDirect or Amazon gets stock back in. You generally want to stick with AMD cards. I believe mine are all ASUS R290’s. I think XFX is really the only brand most people avoid. Hey Matthew. A friend sent this my way, and it’s a great write up. One thing I recommend keeping in mind is the exponential nature of the rise in difficulty. I bought an Avalon Batch 3 ASIC miner and (unfortunately) burned it out (more on that at the end of this video: http://www.youtube.com/watch?v=JJljgM6TSu8&feature=youtu.be) Before I purchased it, I thought I was going to be making a LOT of money… but exponential growth is hard for us to comprehend. Very few mining operations I’ve seen at this point will be profitable because the difficulty increases so quickly. 5.73 months may easily stretch into… never. It’s an arms race, basically. Good luck to you though!